Pareva la torta di Nonna Papera! Looks like Grandma Duck's cake! A classic! At first glance it may seem like a huge ratio of apple to dough and you're going to be tempted to cut down on the apples. Don't! It looks like a lot of apples, but they magically meld into the batter. You'll love the result. 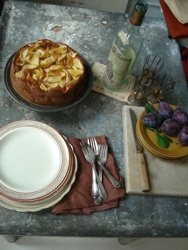 The top half of the cake is chock full of tender apples that float over sweet moist cake. Preheat the oven to 350 degrees F. Butter and flour an 8-inch cake pan. Beat 2/3 cup of sugar and the eggs in a large bowl, using a whisk or electric handheld beater, until creamy and light yellow. Beat in the flour, milk, baking powder, baking soda and zest. Pour the mixture into the prepared pan. Peel and core each of the apples. Dice one of the apples on sprinkle the dices over the batter. Cut the remaining apples into thin slices. Spread the slices over the diced apples in the pan in a neat pattern. Scatter thin pats of butter over the apples and sprinkle with the remaining tablespoon of sugar. Bake for about 50 minutes, until dark golden and cooked through. In Italy practically everyone knows Disney's Elvira "Grandma Duck" Coot, Donald Duck's grandmother. Grandma Duck or Nonna Papera became the iconic American grandmother. She's spry, gets into all sorts of adventures, and yet bakes up beautiful pies. Her pie has taken on an almost mythical status in Italy and is considered quintessentially American. She was so popular in Italy that a children's cookbook featuring her was published in 1970, called Manuale di Nonna Papera. It became a phenomenal success in Italy! Though it has authentic Disney illustrations, it was never published in American, and, in fact, its recipes were really quite Italian. Manuale di Nonna Papera is the source of many fond foodie memories for millions of Italians. To compliment a particularly lovely cake Italians will often say, "Pareva la torta di Nonna Papera! ", it looks like a Grandma Duck pie! It's interesting to note that the Italians don't crimp the edges of a piecrust as we do, so the illustrations of the pies with their undulating borders seemed magical to Italian children. There were also intrigued by the tradition of leaving the pies on the windowsill to cool, something else unfamiliar in Italy.